Add one scoop of Gold Standard 100% Casein to 300 - 350 ml of water or prefered beverage. Use first thing in the morning, immediately before bed, in place of small meals, and/or any other time when delayed protein absorption is desired. To make protein ice cream, just mix one scoop into half the amount of water you normally use (150-180ml), place in the freezer for about 5 minutes - then enjoy! Micellar Casein (milk) [contains Emulsifier: Soy Lecithin], Fat-Reduced Cocoa Powder, Flavour, Salt,Thickeners (Cellulose Gum, Carageenan Gum, Guar Gum), Sweetener (Acesulfame Potassium, Sucralose), Enzyme Complex (Amylase, Protease, Cellulase,Beta-D-Galactosidase, Lipase). 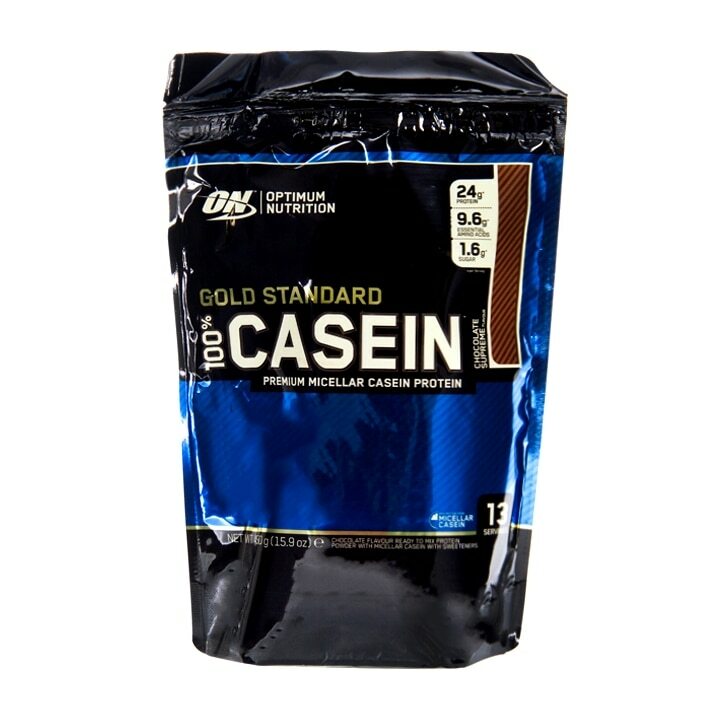 Optimum Nutrition Gold Standard 100% Casein Powder Chocolate is rated 4.5 out of 5 by 8. Rated 5 out of 5 by Martha26 from Brilliant protein Too early too talk about results as I just started taking this powder - regularly take lean whey so will see what the combination will bring. The taste is amazing like a Nesquik cacao powder, when mixed with water tastes like a souffle. Rated 5 out of 5 by Spacebunny from Perfect evening supplement i prefer to cycle my use of supplements so I use whey & casein proteins as well as creating and BCAA's when I'm pushing it and just use s balanced diet when trying to reduce fat and water retention. Casein protein is always a favourite for evening/bedtime supplements and I certainly felt improvements in growth and repair. bottom of my list of importance is flavour but you can't go wrong with this for taste when mixed with water. Rated 4 out of 5 by Isabelle from Amazingly good, but expensive! It is truly the most amazing thing I've ever tasted when it comes to chocolate overall, wheather we're talking about protein shakes, or chocolate bars! When my friends have chocolate pudding, or cake, or any other dessert - I have this with some strawberries, a banana, or just plain. It's DELICIOUS! Rated 4 out of 5 by catfish54 from Mixes very well but not as tasty as whey protein. Easy to mix to a smooth consistency but tastes rather plain. Rated 5 out of 5 by Vidas from brillent, but not the price... Really tasty product, and I find it keeps me full till past lunch time as its truely a slowly digested protein. Its very good for me, as im normally very busy and dont have time to eat durng the working day. try it with natural yoghurt for a scrummy treat! !